Henry Petroski (February 6, 1942) is an American engineer specializing in failure analysis. A professor both of civil engineering and history at Duke University, he is also a prolific author. Petroski has written over a dozen books – beginning with To Engineer is Human: The Role of Failure in Successful Design (1985) and including a number of titles detailing the industrial design history of common, everyday objects, such as pencils, paper clips, and silverware. His first book was made into the film When Engineering Fails.. He is a frequent lecturer and a columnist for the magazines American Scientist and Prism. Petroski was born in Brooklyn, New York, and was raised in Park Slope and Cambria Heights, Queens. In 1963, he received his bachelor's degree from Manhattan College. He graduated with his PhD in Theoretical and Applied Mechanics from the University of Illinois at Urbana-Champaign in 1968. Before beginning his work at Duke in 1980, Petroski worked at the University of Texas at Austin from 1968–74 and for the Argonne National Laboratory from 1975-80. Petroski is the Aleksandar S. Vesic Professor of Civil Engineering and a professor of history at Duke University. In 2004, Petroski was appointed to the United States Nuclear Waste Technical Review Board and was reappointed in 2008. Petroski has received honorary degrees from Clarkson University, Trinity College, Valparaiso University and Manhattan College. He is a registered professional engineer in Texas, a Distinguished Member of the American Society of Civil Engineers, and a member of the American Academy of Arts and Sciences, the American Philosophical Society and the National Academy of Engineering. Henry Petroski talks about The Essential Engineer on Bookbits radio. "Engineering: Scientific Status," in Modern Scientific Evidence, 2002, vol. 3, part 3, pp. 14–54. "The Origins, Founding, and Early Years of the American Society of Civil Engineers: A Case Study in Successful Failure Analysis," in American Civil Engineering History: The Pioneering Years, B. G. Dennis, Jr., et al., editors, Proceedings of the Fourth National Congress on Civil Engineering History and Heritage, ASCE Annual Meeting, November 2–6, 2002, pp. 57–66. The Importance of Engineering History," International Engineering History and Heritage: Improving Bridges to ASCE's 150th Anniversary, Jerry R. Rogers and Augustine J. Fredrich, editors. History Congress proceedings, American Society of Civil Engineers, Houston, Texas, October 2001, pp. 1-7. "Reference Guide on Engineering Practice and Methods," in Reference Manual on Scientific Evidence, 2nd edition, Washington, D.C.: Federal Judicial Center, 2000. pp. 577–624. "The Britannia Tubular Bridge: A Paradigm of Failure-Driven Design," reprinted in Structural and Civil Engineering Design, William Addis, ed. Aldershot, Hampshire: Ashgate Publishing Ltd., 1999, pp. 313–24. "Polishing the Gem: A First-Year Design Project," Journal of Engineering Education, October 1998, pp. 445–49. "Infrastructure," American Scientist, September–October 2009, pp. 370–74. "Bridging the Gap," New York Times Magazine, June 14, 2009, pp. 11–12. "Want to Engineer Real Change? Don’t Ask a Scientist," Washington Post, Outlook Section, January 25, 2009, p. B4. "Calder as Artist-Engineer: Vectors, Velocities," in Alexander Calder: The Paris Years, 1926–1933, ed. Joan Simon and Brigitte Leal (New York, Paris, and New Haven: Whitney Museum of American Art, Centre Pompidou, and Yale University Press, 2008), pp. 178–83. "The Importance of Civil Engineering History," Proceedings, International Civil Engineering History Symposium, Canadian Society for Civil Engineering, Toronto, June 2–4, 2005, pp. 3–8. "The Evolution of Useful Things: Success through Failure," Proceedings of the Design History Society Conference on Design and Evolution, Delft, The Netherlands, August 3-September 2, 2006. In CD format. "An American Perspective on Telford," The 250th Anniversary of the Birth of Thomas Telford: Collected Papers from a Commemorative Conference Held on 2 July 2007, Royal Society of Edinburgh, pp. 44–46. "Foot in Mouth: The Toothpick’s Surprising Debt to the Shoe," Huntington Frontiers, Spring/Summer 2007, pp. 22–24. "What’s in a Nametag?" American Scientist, July–August 2007, pp. 304–08. "The Paradox of Failure," Los Angeles Times, August 4, 2007, p. A17. "Success and Failure: Two Faces of Design," The Bent of Tau Beta Pi, Fall 2007, pp. 27–30. "Picky, Picky, Picky," Los Angeles Times, October 30, 2007, p. A23. "The Glorious Toothpick," The American, November/December 2007, pp. 76–80. ^ "When Engineering Fails by Henry Petroski (video)". Archived from the original on 30 July 2003. ^ Petroski, Henry (2002). Paperboy: Confessions of a Future Engineer. New York: Alfred A. Knopf. ISBN 0-375-41353-7. ^ Contemporary Authors Online, Gale, 2008. Reproduced in Biography Resource Center. Farmington Hills, Mich.: Gale, 2008. ^ "NWTRB Board Member". Archived from the original on 2007-06-30. Retrieved 2007-05-04. 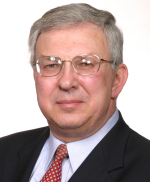 ^ "Petroski Honored With the 2014 John P. McGovern Award for Science". blogs.asce.org. ^ "Memo from the Dean 4/23/07". Archived from the original on 2007-06-09. Retrieved 2007-05-04. ^ "Petroski Honored for Making Engineering Understandable". Archived from the original on 2007-06-09. Retrieved 2007-05-04. ^ "Washington Award". Archived from the original on 2009-02-12. Retrieved 2007-05-04. Learning from bridge failure: Collapses such as the I-35W in Minneapolis give engineers the best clues about what not to do. Let's hope the lessons are remembered. by Henry Petroski. LA Times, op-ed, August 4, 2007.